An uplifting salt scrub that gently polishes and conditions the skin. Great for feet, legs, and all-over body use. Feet work hard each day, and it often leaves them tired and dry. SPAPEDICURE® products are formulated to deliver what toes and feet need, creating smoother, younger-looking skin. Marine SPAPEDICURE® uplift and moisturize with specialized blends that are born of the sea. Walking on the wet sand is a great way to naturally exfoliate feet. Some of us can’t get to the beach, though, so we need an alternative! Marine Salt Scrub is just the product you need to replicate the natural effects of an oceanside stroll. Sea salt polishes and refines skin, all while conditioning and relaxing feet. 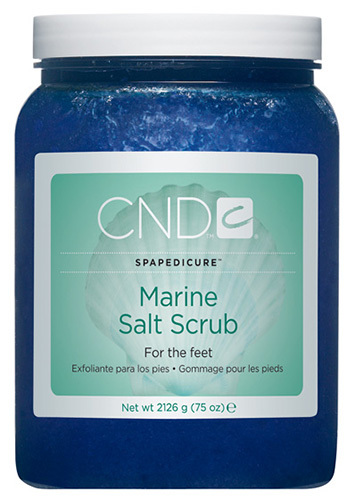 Use after Marine Mineral Bath to ensure that feet are ready for this skin-softening treatment. Then, follow with Marine Cooling Masque and Marine Hydrating Oil for the full effect. For the Media Careers ©2019 Creative Nail Design, Inc. All Rights Reserved.